New 98211R,1/18th scale Jaguar XJ6 4.2 Series 1 (RHD) in B.R.Green. �.99 "Now available to order." New 98211L,1/18th scale Jaguar XJ6 4.2 Series 1 (LHD) in B.R.Green. �.99 " Now available to order." New 98321R,1/18th scale Jaguar Mk2 3.8 1962 (RHD) in Opalescent Silver Blue �.99 " Now available to order." New 98321L,1/18th scale Jaguar Mk2 3.8 1962 (LHD) in Opalescent Silver Blue �.99 " Now available to order." New 98301R,1/18th scale Jaguar XJ6 2.8 Series 1 (RHD) in White �.99 " Now available to order." New 98301L,1/18th scale Jaguar XJ6 2.8 Series 1 (LHD) in White �.99 " Now available to order." New 98212,1/18th scale Rolls Royce Phanton V (RHD) John Lennon �9.99 " Now available to order." 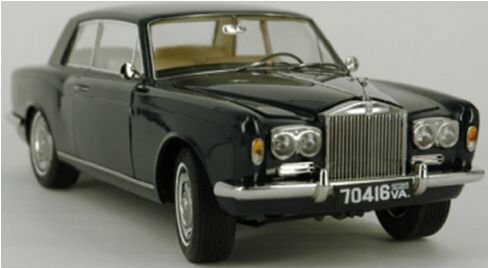 New 98213R,1/18th scale 1964 Rolls Royce Phanton V (RHD) in Black �5.99 "Now available to order." New 98213L,1/18th scale 1964 Rolls Royce Phanton V (LHD) in Black �5.99 "Now available to order." New 98204R,1/18th scale 1964 Rolls Royce Silver Shadow MPW (RHD) in Burundy Red 2 Door �9.99 " Now available to order." New 98204L,1/18th scale 1964 Rolls Royce Silver Shadow MPW (LHD) in Burundy Red 2 Door �9.99 " Now available to order." New 98311R,1/18th scale Daimler 250 V8 1967 (RHD) in Black �.99 " Now available to order." New 98311L,1/18th scale Daimler 250 V8 1967 (LHD) in Black �.99 " Now available to order." New 98312R,1/18th scale Daimler 250 V8 1967 (RHD) in Regency Maroon �.99 " Now available to order." New 98312L,1/18th scale Daimler 250 V8 1967 (LHD) in Regency Maroon �.99 " Now available to order." 92001, 1/12th scale resin Bentley Continental GT 2003 in Silver Storm �5.00. Now available to order. 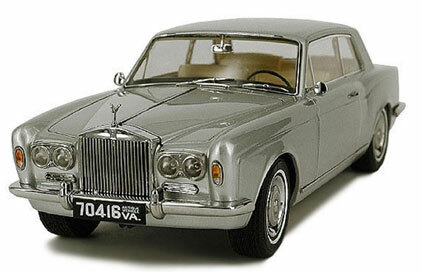 New 98211R,1/18th scale 1964 Rolls Royce Phantom V RHD in Silver �9.99. Now available to order. New 97031,1/18th scale BMW F06 650i GT (LHD) in Space Grey �.99. Now available to order. New 97032,1/18th scale BMW F06 650i GT (LHD) in Alpine White �.99. Now available to order. New 91031,1/43rd scale BMW F31 3 Series Touring (lhd) in Black Sapphire �.99. Now available to order. New 91032,1/43rd scale BMW F31 3 Series Touring (lhd) in Melbourne Red �.99. Now available to order. 98201, 1/18th scale 1968 Rolls Royce Mulliner Park-Ward 2-Door Coupe in Silver Chalice (Limited Edition of 5,000 pieces Worldwide) �9.99. Currently out of stock. 98202, 1/18th scale 1968 Rolls Royce Mulliner Park-Ward 2-Door Coupe in Black (Limited Edition) �9.99. Currently out of stock. 98203, 1/18th scale 1968 Rolls Royce Mulliner Park-Ward 2-Door Coupe in Oxford Blue as in the 1968 film 'The Thomas Crown Affair' starring Steve McQueen (Limited Edition) �9.99. Now available to order. This exclusive, Limited Edition 2 door sedan was specially built to individual customer requirements by the company's in-house coachbuilder Mulliner Park-Ward Limited. The cars were hand built using only materials of the finest quality, including Wilton carpeting, Connolly hide and Burr walnut veneers. This lengthy process took all of 20 weeks and resulted in a price of 50% higher than the standard Silver Shadow. Nethertheless, demand for this more glamorous alternative to the more numerous Silver Shadow was strong right from the start, which resulted in them being given their own name 'Corniche' in 1971. Paragon is a new name in the diecast industry and has been formed with the intention of producing high quality models of some of the most iconic motor manufacturers of the past and present. The Company's first release is this custom built version of the iconic 1960's Rolls Royce Silver Shadow, which shot to fame when it appeared in the 1968 movie 'The Thomas Crown Affair' starring Steve McQueen and Faye Dunaway.